OrienTrax™ combines the classic look of an elegant area rug with the function and durability of a high performance entrance rug. 24 ounces of twisted nylon fiber per square yard provides superior moisture absorption and retention, while a heavyweight non-slip backing ensures minimal mat movement. A dye-injection process that infuses dye deep into the yarn strand ensures that the vibrant color designs won't fade. 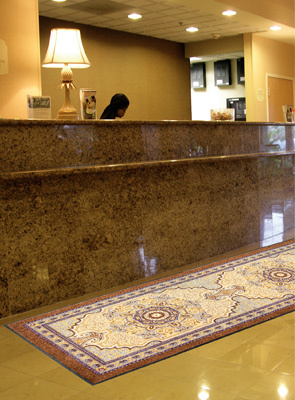 OrienTrax™ is a step above traditional single color entrance mats adding aesthetic appeal to any doorway. 24 ounces of twisted nylon fiber per square yard provides superb moisture absorption and retention. A heavyweight non-slip backing ensures minimum movement. Vibrant color designs that won't fade. 3/8" thickness with 5/8" border width.